FOR COLLECTORS OF LIVING ART. Thank you for stopping by. Welcome to Fire and Ice Bearded Dragons, small, privately- owned bearded dragon breeders who specialize in HIGH QUALITY, high color morph bearded dragons for sale. We breed for gorgeous color morph bearded dragons that are also genetically strong and HEALTHY. Satisfaction & 30 Day Health Guarantee. Pedigrees are sent with each dragon purchased. The original breeders of the 100% Citrus bearded dragon, these dragons are pure bred and breed true. We have expended much since then to offer every major morph and mutation we feel has the vigor to live a long and healthy life. See the For Sale page for availability. The staff of REPTILES MAGAZINE has voted our Citrus color morph as #1 of their 15 Best of the Best color morphs of ALL reptile morphs submitted over the past 15 years. Thank You, Reptiles USA!!! The FOR SALE section has pictures of available bearded dragons and upcoming clutches. The PRICING & BREEDERS section shows many of our bearded dragon breeders, the health & satisfaction Guarantee as well as Shipping information. The CARE SHEET provides instructions and tips on juvenile bearded dragon care, caging, foods and optimal temperatures. There is also a link to a Food Chart for adult bearded dragons. To read the The Standard of Excellence for the 100% Citrus Color Morph, click the CITRUS page. Visit the GALLERY for pics of our breeding facility, incubating bearded dragon eggs and a few of the breeders that have been with us in previous years. 1. You will find the accurate information and on-going support you need. With 17 years experience, we have the knowledge to make your experience a fun and positive one! 2. 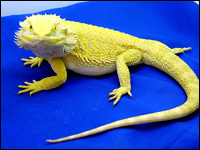 As originators of the first Reptile Pedigree Program in the world in 2003, Pedigrees are provided. 3. Our dragons are HIGH QUALITY and genetically strong. We also feed the best: Juveniles are fed 2 -3 times a day with a variety of protein foods including crickets, phoenix worms and Dubia roaches as well as pesticide-free, organically-grown greens. 4. Our close association with the Veterinary Community guarantees your bearded dragon to be healthy. Additionally, we test the latest protocols for from the Vet community to assure that our recommendations to you are state-of-the-art in dragon care. 5. We make sure your bearded dragon is healthy and eating well before he or she is shipped to your home. FIRE morphs include Reds, Super Orange, Tangerine, Citrus and Super Citrus. include Red and Hypo Trans; Leatherbacks in Red and Citrus. ICE morphs include Hypo Ice, Zero's and Hypo Pastels. Our articles have also appeared in Reptiles Magazine, Reptile Care, Animal Chatter and many other publications including the June 2005 front page article, "Raising the Bar" in The Keeper formerly published by The International Fauna Society. Read our Reptiles Magazine article,"Beardie Basics." Also see Reptiles Magazine December 2009 issue for the article, "Designing Dragons" on breeding color morphs. NEWS! we are over the moon on being selected as The Best of the Best in the Reptiles USA annual magazine. The staff of Reptiles USA voted our Citrus dragon, "Goliath" #1 Best of the Best over every reptile color morph submitted each month for the past 15 years!